Avocado Insalata Bruschetta is an easy blend of fresh vegetable spread on toasted bread or perfect for vegetable toppings. This is one recipe everyone raves about! Avocado Bruschetta or even my Guacamole dip is perfect for parties and take alongs to picnics. Avocado has so many health benefits and is also a healthy brunch or lunch any day of the week to add to your diet. Check out the other ingredients in this avocado spread that make it so delicious! I just love fresh vegetables and I am not a huge carb fan. I always make an this for a summer special treat for my guests or quick lunch. Whenever we have a family get together, I love making this bruschetta. Leave The Bread Out for dietiers! You can use cucumbers slices, zucchini strips or even some lettuce leaves and roll this dip up for the perfect diet food! I actually leave the bread in a big bowl and let them spread it themselves. This spread is great right out the refrigerator or at room temperature. I have even packed it just in a container and used cucumber slices for the dipping instead of the bread as I mentioned before for picnics and boat outings. This avocado insalata bruschetta is like having a great little salad on your garlic toast. You can even used sliced of zucchini instead of bread or even long slices of cucumber instead of making slices for dipping. Whatever you choose to do and how your healthy lifestyle diet is prefered, try this as a wholesome snack. Avocado has so many health benefits. There are many articles written on how great it is for skin, bones, heart and can even ward off cancer. It's even great for digestion. There are so many healthy reasons to eat it. I love growing my own trees here in Florida. We have an abundance of avocado here so this is something I am lucky to make all year long. I personally eat at least one avocado every other day. I love them on top of a regular leafy green salad. Anyway I can get avocado into my diet, I will make sure I eat it weekly. Check out the photos and how to cut Avocado plus a Bonus GUACAMOLE DIP Recipe at the end! As you can see I have provided many photos on how to cut up an avocado. They are easy to slice, chop or pit and best and easiest part is taking the knife and on a ripe avocado. Taking the tip of that knife and just folding back the skin the whole avocado will peel back! It's so easy. There are always ingredients in every recipe you can change up. If you aren't a fan of olives try another chopped item like fresh green hot peppers to give it a little kick. Avocado is a must for keeping weight regulated! Keep this recipe on hand, through the entire summer you can shed pounds as it is low calories and the good fat in avocado will help get rid of unwanted weight. Healthy eating never tasted so good. Easy to make. Many options to change it up the way your family will eat it. I love easy healthy recipes, don't you? No one even knew that was the main ingredient in this spread. Don't forget to check out my GUACAMOLE DIP at the end. Avocado Bruschetta and Guacamole Dip is delightful on top of cucumbers and no bread too! No Matter Which Way You Slice it! Just remember no matter which way you slice it, or eat it, as soon as the air hits avocado it starts to turn off color brown. I immediately squirt some lime juice on top, fresh is best. I really dislike serving something that looks unappealing to the eye. This little bit of lime juice on your avocado will keep you Avocado Bruschetta and Guacamole Dip looking fresh! Mash avocado, add pesto sauce, oil, salt pepper, some chopped basil on top for garnish if you like. Make Garlic Toast with Italian bread. Spread with avocado topping, and serve, garnish with fresh basil. Wash, peel, pit and mash avocados. Add finely mince the garlic. Add remaining ingredients. This can be made in a food processor or using a blender. Serve with crackers and tortilla chips, sliced cucumbers, sliced zucchini or any other vegetable you like for dipping. This looks like an amazing bruschetta. Love the addition of the avo. So pretty and fresh! This looks like the perfect dish to eat poolside. I am such an avocado nut that these would not last long around my house. That's so good! I could eat this all the time. This looks right up my alley (however Grumpy probably wouldn't eat it because of the avocado, picky, picky!) It looks and sounds yummy! That is one great looking bruschetta! Wish I had a bite or two! Another recipe to add to my list! bruschetta! what a great idea to add avocado for a contrast of flavour!! unique manner for a bruschetta!congrats! These are just about all of my fav salad ingredients. No salad is complete to me without an avocado! And wouldn't you know it - I'm looking at a ripe avocado! I also do an avocado bruschetta so am in tune with how tasty this. Your scrumptious addition of pesto is inspired. Again - you inspire. 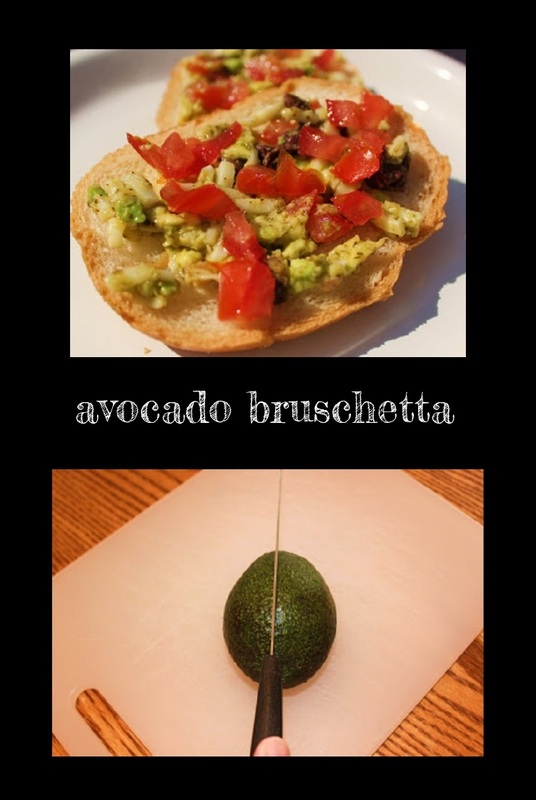 I'm loving this bruschetta with avocado, yum! Love the colors in the bruschetta...very light and refreshing! Love avocado! I especially like the idea of putting this on bruschetta! I usually use avocado in salads and in Mexican themed dishes, but this would be great! This bruschetta looks so light and refreshing, loving it! thank you everyone and Happy Cinco De Mayo! I have never combined avocado with pesto sauce, I want to try it! This is marvellous - a very imaginative use of avocado. Love the fresh summery look and feel of it! This is so creative! I love this dish so much. This is a fantastic idea for quick and easy appetizers. Avocado, pesto and olives? Yum! Oh this looks amazing, all my favorite summer things! I am sooo envious of your avocado tree! I grew up in Florida and I miss those huuuuge FL avocados! I absolutely love tomato bruschetta and addition would be better than avocado. This sounds so good! I love making bruschetta and this is the perfect way to use up all those lovely tomatoes from my garden!